PNG – has wider palette then GIF and half-transparency but size of file is bigger and you need to use special tricks to display PNG in Internet Explorer 6 (which is still one of the most popular browsers and its version) and lower. Personally I use PNG only in cases when it’s not possible to avoid using half-transparency. “File – Save for Web and Devices” menu is used for optimization images in Photoshop. Hot keys “Alt+Shift+Ctrl+S”. I use “Save for Web” menu even when I save photos or previews for photogallery. It’s more comfortable then to play with JPEG options from menu “Save” or “Save As”. You optimize an image, adjust settings of JPEG quality and can see size of the file and also quality of optimized image which you can compare with original file. 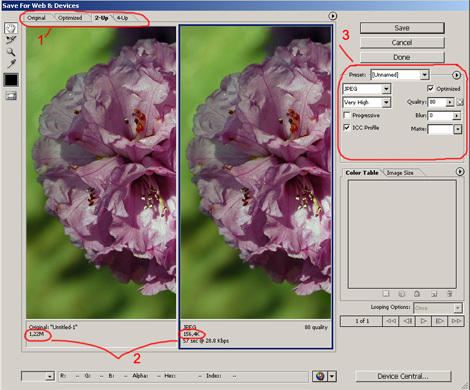 1 – Image preview. I prefer to use 2-up settings where can compare quality of original image with optimized copy. 2 – Size of the file. Size of original and optimized files are displayed in preview windows. Also you can see how long it takes to load image on different connection speeds like modems or cable. Type of connection can be chosen by mouse right button click above these parameters. 3 – Optimization settings. This window has different settings depending on file format – JPEG, GIF, PNG-8, PNG-24 or WBMP. ICC profile contains colour management information – how certain devices reproduce colours. Because not all browsers support ICC profile it’s better to uncheck this field what also helps to reduce size of file. reduce size of the file adjusting parameters in lossy field.